Some new development on this side. We are going to experiment with an Ettus Research USRP1. This is a whole new ball game and it will take some time to get to now this SDR device. 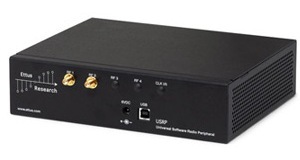 The USRP1 is the original Universal Software Radio Peripheral™ hardware (USRP) that provides entry-level RF processing capability. It is intended to provide software defined radio development capability for cost-sensitive users and applications. The architecture includes an Altera Cyclone FPGA, 64 MS/s dual ADC, 128 MS/s dual DAC and USB 2.0 connectivity to provide data to host processors. A modular design allows the USRP1 to operate from DC to 6 GHz. The USRP1 platform can support two complete RF daughterboards. This feature makes the USRP ideal for applications requiring high isolation between transmit and receive chains, or dual-band dual transmit/receive operation. The USRP1 can stream up to 8 MS/s to and from host applications, and users can implement custom functions in the FPGA fabric.